Statistics are everywhere. You hear them in the news. You hear politicians cite them in speeches. You hear TV announcers broadcast them in sports. It is often said that statistics can be manipulated for a variety of interpretations and can be made to say whatever you want them to say. Two of my favorite books, “Innumeracy” by John Allen Paulos and “Proofiness” by Charles Seife, illustrate how a lack of statistical literacy makes us poor citizens. As a math teacher, I try to instill my students with critical thinking and questioning skills to help them understand basic statistical ideas like modeling, correlation, and significance. Until recently, statistics had been one of my weaker fields in mathematics. That changed when I spent five weeks this summer interning at SAMSI (Statistical and Applied Mathematical Science Institute) conducting statistical analyses of climate data. Through this experience, and the guidance of my mentor Dr. Richard Smith, director of SAMSI, I was able to solidify the fundamentals as well as an advanced knowledge of statistics. I believe that one mark of a great teacher is one who never stops learning and growing. The more I develop knowledge of my content and the application of that content, the better I am then able to teach my students. 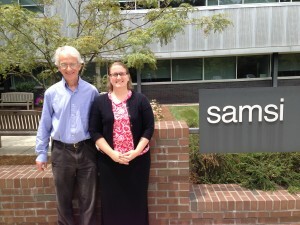 I learned so much during my time at SAMSI including a new coding language. When I returned to school in the fall, I found myself reflecting on my Kenan Fellows experience, and the snapshot I got into the life of a professional in the mathematics field. Students in a math class shouldn’t have to ask, “When am I ever going to use this?” Shouldn’t we be creating math classrooms in which students know the answer because the context is authentic and rich? My internship through the Kenan Fellows Program helped me transform my classroom into a place where math is learned because it is a necessary tool to answer a genuine question: Is the world around us predictable? Students need to know that there are real professionals using mathematics to model and solve real, important, and interesting problems. Students in school learning math should be doing this too. My internship made me much more aware of this, and I’ve challenged myself to make assessments that are authentic and interesting, but most importantly that model the skills needed for careers in math or science. 2014-15 Kenan Fellow Liz Moffitt teaches at Lakewood Montessori Middle School, a magnet school that is part of Durham Public Schools. Her Kenan fellowship, “Hurricanes, Tornadoes & Climate Change” was supported by SAMSI and NISS. She has been teaching for seven years and holds a M.Ed. in Gifted Education from Elon University and a B.A. in Mathematics from the same institution.